Instead of giving you the "frozen look," Dysport® temporarily treats the facial muscles in just the area you want — between the eyebrows. 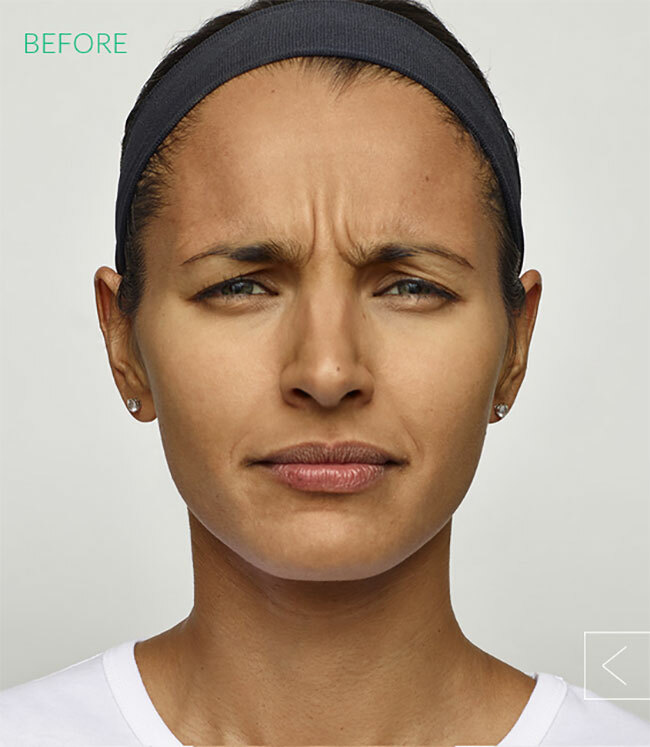 With Dysport®, it's the frown lines between the eyebrows that are minimized, not your expressions. That's certainly something to smile about. Why do 97% of Dysport® users say they'd use it again? The results speak for themselves. 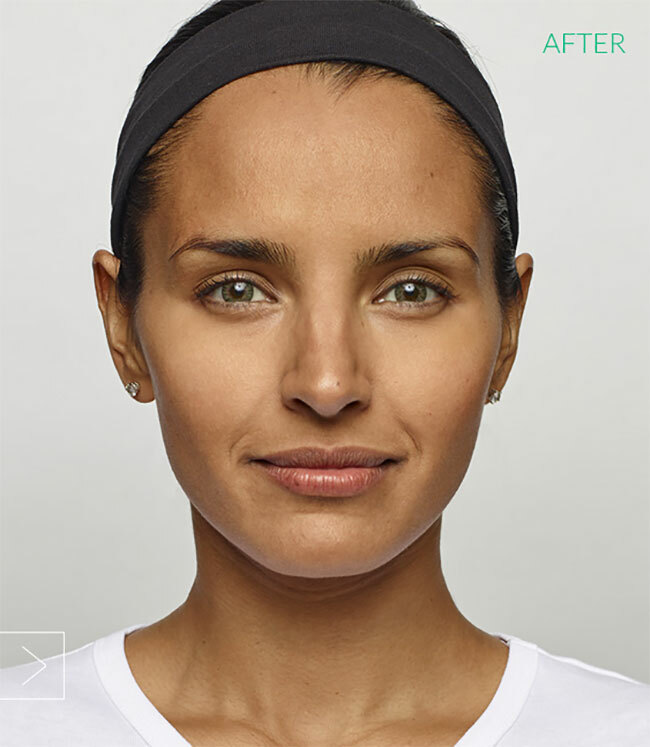 Look through our gallery to see how Dysport® has smoothed moderate to severe frown lines between the eyebrows for men and women. Fact 1: Creams and lotions don't always cut it. Your skin care regimen probably includes a number of over-the-counter cosmetic products. That's perfectly fine, but when it comes to improving the look of moderate to severe frown lines between the eyebrows, a prescription treatment may be the right choice for lasting results. Fact 2: It's not an age thing. Of course time is a factor. Wrinkles and frown lines between the brows don't simply mean you're getting older. They're caused by repeated movements and muscle contractions, which means they can even develop in younger adults. 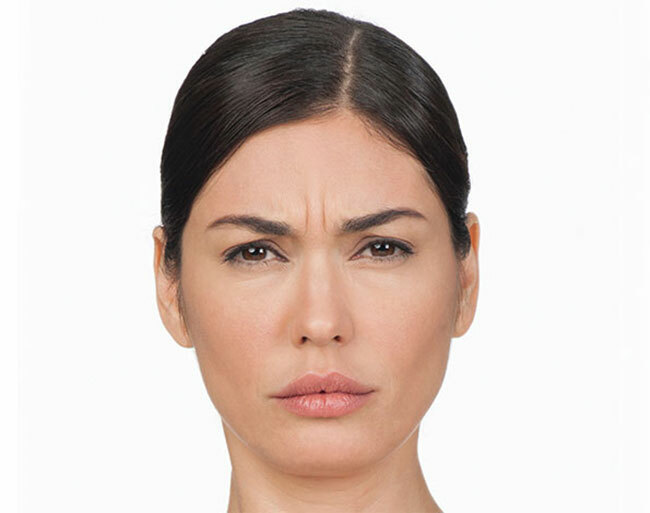 Frown lines, "elevens" or glabellar lines are the product of repeated movement of your facial muscles. It's the mark of an expressive face. Dysport® lets you keep the expressions and minimize the evidence. Fact 3: You don't have to "live with 'em." You squint, you smile, you frown — wrinkles happen. That's life. But that doesn't mean you have to accept it. Dysport® is here to help you stand up to the lines between your eyebrows and take control of your look. What's the difference between Dysport® and Botox®? "There really isn't much of a difference between Botox and Dysport. Botox is made by Allergan (same company that makes Juvederm and Kybella) and Dysport is made by Galderma (company that makes Restylane, Silk, and Lyft). They both are great. The dosing is different but comparable. Dysport tends to be more affordable and my patients that prefer it say it comes on faster and does last longer. Botox is more of the name brand and has more market share. I've injected both on my family with great results." "Dysport is probably getting more attention now that it has been out a long time just like regular Botox. It may last 1 month longer than regular Botox (4-5 months vs. 3-4 months) in half of the patients. It does kick in a few days quicker also. They generally run the same price." "Botox and Dysport are both great products. They are nearly identical; both are Botulinum toxin type A, purified from the Clostridium botulinum bacterium. Minor differences result from the manufacturing process. In my experience, most patients get 4 months or more duration from Dysport. I find that Botox lasts 3-4 months at an equivalent dose, so Dysport usually lasts longer. Both can be used in multiple areas of the face. I see no difference in side effects: no allergic reactions; well under 1% eyelid droop for both. Dysport also starts working a little faster than Botox and diffuses, or spreads out, a little bit more than Botox, so it can look a little more natural in the forehead. Most doctors prefer Botox or Dysport based on their experience and preference. I do think that some doctors overemphasize their preference, especially if they use only one in their practice. Generally, it's best to find a doctor familiar with both. Xeomin is the third FDA-approved Botulinum toxin. It is also similar but may not last quite as long as Botox or Dysport." "Botox and Dysport are different brands of neuromodulators and are both used to smooth lines, lift eyebrows etc. 1 Unit of Botox is comparable to 2.5 Units of Dysport. Dysport diffuses (spreads) a little more than Botox so it will need to be placed a little different than Botox. Dysport comes on a little faster and some people feel it lasts longer." BOTOX® Cosmetic is a prescription medicine that is injected into muscles and used to temporarily improve the look of both moderate to severe crow's feet lines and frown lines between the eyebrows in adults. BOTOX® Cosmetic targets one of the underlying causes of frown lines and crow's feet—the repeated muscle contractions from frowning and squinting over the years. Your specialist will inject these muscles with BOTOX® Cosmetic to temporarily reduce muscle activity. You will begin to notice a visible smoothing of your crow's feet lines and frown lines between your brows. Xeomin (Zeo-min) is a prescription medicine that is injected into muscles and used to improve the look of moderate to severe frown lines between the eyebrows (glabellar lines) in adults for a short period of time.